Bumblebee is proving to be a sleeper hit prior its final few days in the big screens. The foundation that Michael Bay laid with the sci-fi Autobots’ action thriller over a decade ago is finally paving the way for other tentpole movies from its own universe. And Paramount's' first Transformers standalone Bumblebee has now raked over $400 million at the worldwide box office. The franchise kicked it off boarding Bay way back in 2007 with the first film Transformers, and Bay went onto continue the legacy until 2017 with the release of Transformers: The Last Knight - which didn't have much trouble connecting with critics, but only managed to swing in the then lowest gross among the franchise with $605 million worldwide. The Transformers’ regime was then passed to Travis Knight from 2016’s stop-motion fantasy film Kubo and the Two Strings. He was assigned to direct a Bumblebee solo movie and set the story in the 1980s to unfold the event of getting back to the G1 designs of the original toys. And with the new human lead, Hailee Steinfeld along with the combination of Bumblebee, Knight, and the ’80 seems to be paying off. Quitely, swooping in its own audiences amidst the shadow of DC’s Aquaman, Bumblebee is proving to be the best-reviewed entry in the franchise and now is heralding its way to emerge out as one of the best and most surprising blockbusters of 2018. Unfortunately, the box-office metrics for the film hasn't been quite as strong as its prior entries, but the underdog from the team Optimus, is somehow still en route to cross that major milestone. 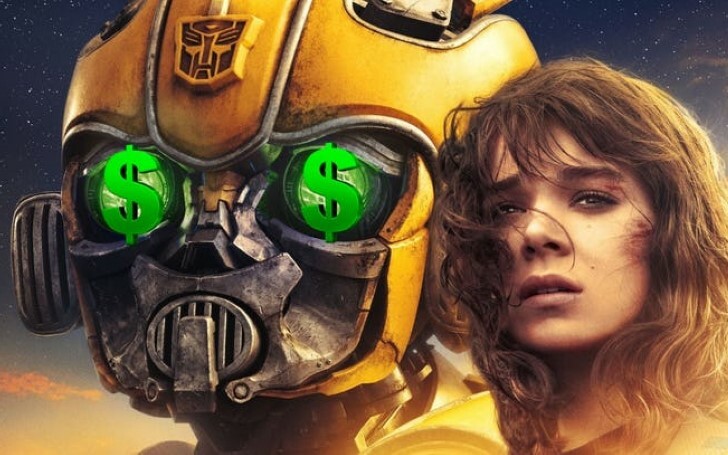 Deadline revealed that Bumblebee topped the $400 million mark internationally this weekend at the box office. The gross though, is still heavily biasing towards the overseas, as the film currently sits atop a domestic total of just over $110M. This means nearly $300M of Bumblebee's box office comes from the screens offshore and over $100M from China alone. The film is still in its theatrical run in all territories except for Japan, which will see the solo film premiering on March 22. The box office performance of Travis Knight’s directorial, Bumblebee is a major topic for the fans of the Cybertron. It's been assured that the spinoff is "solidly profitable" for Paramount and this will be even truer now that Bumblebee has crossed a staggering $400M figure. With the film reportedly having a budget slightly higher than $100M, the now looming out as the lowest grosser among its other parent blockbusters, Bumblebee, is still revered as a success. Add to that, Steinfeld and fellow cast member John Cena were putting forward from the beginning that they weren't much concerned about the film's immediate box office numbers which now seems there's no reason to anymore, at all. Now that Bumblebee is finally considered as a moderate success, fans will surely be craving to hear if a sequel is under the talk. One thing you can bet is that writer Christina Hodson might be already in, but before that there’s a whole lot of signatures to bring from the Paramount, itself to actually do a true follow-up. However, the ending of the film certainly mocks up the franchise to tell several other stories, so at the end, it is all up to the studio's decision at this point. As for now, Bumblebee is still looking to round off the title for the 2019’s highest grossing movies with the current table position at 9th which is just behind Sony Pictures’ thriller adventure Escape Room with its existing total standing at around $54 million. And yes, the gross is far lower than that of Bumblebee, but with an edge of the late release, Escape Room is currently bringing a grand or two more than Bumblebee as on Sunday the former managed to count $1,470,000 with later just over $1,460,000. Moving up is the Disney's Mary Poppins Returns still nabbing in between $2 million to around $1 million as the same weekend, the Emily Blunt starrer delivered around $1,748,000 add to its global box office of $306 million against the initial venture of $130 million. And shockingly, at the 6th is the last year’s holiday release from Sony’s, Spiderman: Into The Spiderverse, which is still nowhere near backing off as the animation flick in Sunday again managed to swoop another $2,250,000 onto its total gross of $323 million. Subsequently sliding upwards, is the Bryce Dallas Howard starrer family drama adventure, A Dog Way Home, which is seemingly taking millions like pro following its Sunday’s $2,260,000 in its total of $26.4 million. And dancing it off at the top four are Akira Toriyama’s anime featurette Dragon Ball Super: Broly with a whopping $65 million hence eight times folding its production cost of $8 million, James Wan surprising Aquaman (ensembling the likes of Jason Momoa and Nicole Kidman) with an astounding ten figure of billion dollars, the remake of the French landmark Intouchables, The Upside featuring Bryan Carnston and Chris Rock with $48 million. And thus crowning the chart is the most recent entry of M. Night Shyamalan’s Glass with an opening of $15 million and altogether amassing around $90 million in just three days’ period against its production cost of $20 million.